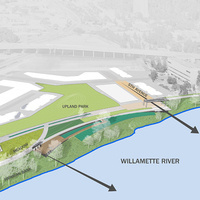 Envisioned for over thirty years as Eugene’s urban re-connection to the River, the Riverfront Park will be the first in a series of developments on the 20-acre former EWEB Operations site and is expected to be open by Spring of 2021. Project highlights include river bank remediation, bike path reconstruction, overviews, and integration of art and history into the landscape. Questions and discussion will follow the presentation. The Schematic Design phase was completed in the fall to be followed by Design Development and Construction documents. As part of the Design Development process, the team is also working to do some additional public outreach. An important group to reach out to is the Eugene design community including Architects, Landscape Architects, students, faculty, and the community at-large. This presentation will address the public process, project history, and work going forward - followed by questions and discussion. This is an exciting project and the largest that Parks and Open Space has undertaken, reuniting our city with the river, and we hope you join us.